Today, I was detained by the TSA for about 30 minutes for taking pictures while going through security. Taking pictures is perfectly legal. I wasn’t trying to cause trouble. I frequently take pictures of the screening area when I pass through airports. I work in the (cyber) security industry, so I’m interested in such things. In this case, I saw something I wanted to photograph and blog about (which I describe at the bottom). Some sort of manager (old grizzled guy) was summoned to deal with me. He was dressed like the rest in a blue TSA shirt, but must’ve been one level more senior than the TSA employees who were shouting at me to stop photographing. The old guy, with a couple other agents, escorted me through the normal process of putting my bags through the x-ray and going through the "advanced imaging" scanner. I was planning on asking to get groped instead, but I didn’t want to push it, so I meekly complied. When I finally got through the machine, my computer and iPhone had been taken off the belt, and had been in possession of the old guy for several minutes. He was holding them at a station at the far end of the conveyer belt. I asked him to return my items and let me go. He said no, and told me that I was to take a seat while they called people to figure out what to do. Several agents surrounded me preventing me from leaving, while there was a buzz around the main desk as they called people. TSA: Why are you taking pictures? What’s your motivation? Me: I find it interesting, and I want to post the pictures to my blog. TSA: You can’t take pictures in this area. Me: Well, I read the TSA guidelines on the web a few months ago, and they clearly state that people can take pictures in this area. Me: Can you show me the rules that say that I cannot? TSA: (Nodding over to the main desk) They are checking on that now. TSA: You have to show us your pictures and delete them. Me: I’m not going to delete my pictures. TSA: Show us the pictures you took. Me: If I unlock my phone, I want assurances that you will give me the chance to relock it before you take it from my control. TSA: We can’t give you any promises. Me: So I’m not going to unlock my phone. Q: When is your flight? The implied issue was that if I didn’t comply with their demands, they could detain me long enough to miss my flight. On the flip side, they weren’t happy having to deal with me, which was disrupting their routine. They certainly weren’t going to be happy detaining me for 2 hours to make me miss my flight. I tried to act nonchalant, as if I didn’t care about the time, but I certainly did. This is Thanksgiving, the flights are full, so it’s unlikely the airline would be able to book me on another flight. If I missed that flight, it would mean missing Thanksgiving. On the other hand, it would be a better blog if the TSA forced me to miss my flight for doing something that is perfectly legal. So I decided I was willing to miss my flight, making me as calm on the inside as I was trying to project on the outside. Another discussion I heard between a TSA agent and a police officer was something about escorting me back out through security (i.e. denying me access). I didn’t actually talk to him. I feel stupid now; I should have pointed out to him that I felt I was being illegally detained by the TSA. 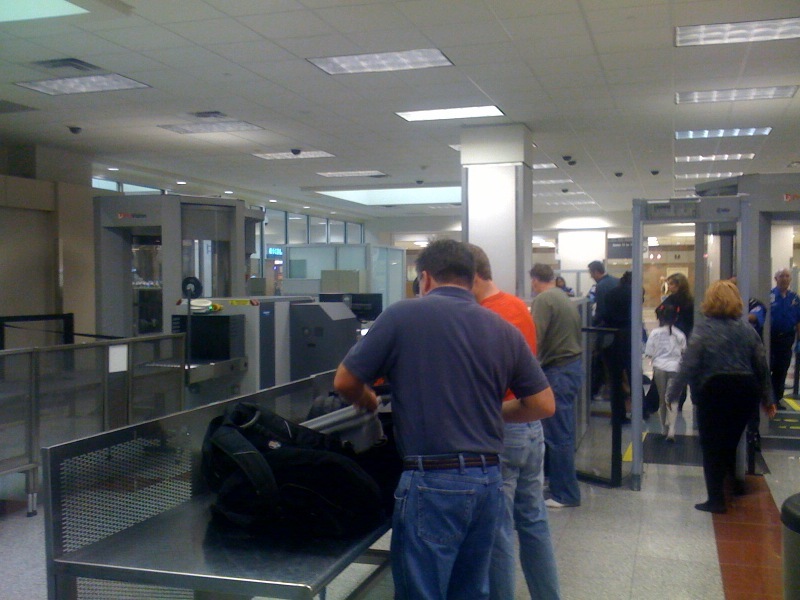 TSA: Don’t you have normal operating procedures at your work? 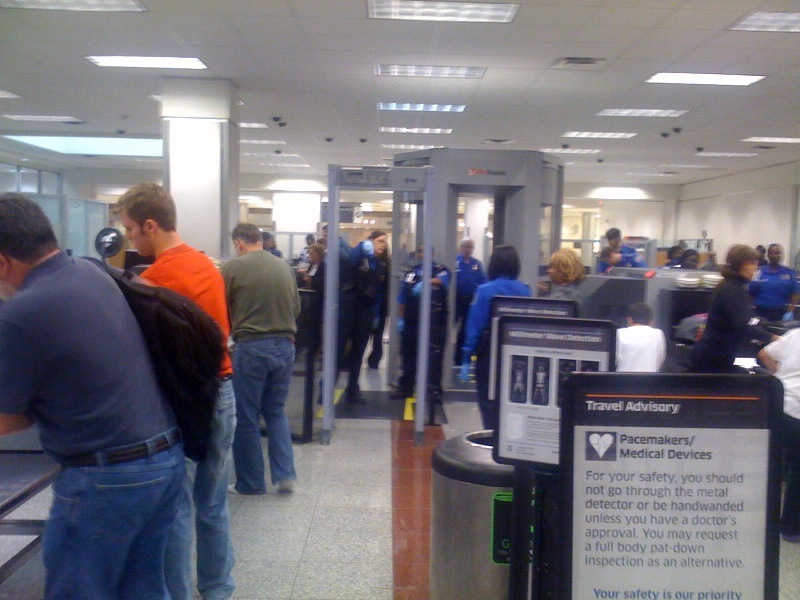 TSA: How would you like it if somebody came to your work and disrupted your procedures? How would you like it if people took pictures of you at your work? Me: I don’t work for the government. Government agencies need to be accountable to the public, and therefore suffer disruptions like this. TSA: Not all parts of the government are accountable to the public, especially the TSA. Me: Wow. No, ALL parts of the government are accountable to the people, especially the TSA. I’m not sure what type of country you think we live in. This made me angry. Up to this point, I was trying to project a calm, relaxed attitude. I don’t want to be like those hippy douche-bag activists that try to provoke the TSA with their passive-aggression or belligerence. I wanted to be the calm, relaxed, easy going guy that while standing for principle, was nice about everything else. At several points, I pointed out to the guards that I wasn’t upset, that I understood their job, that I supported their work, and that I was willing to comply with anything that didn’t infringe my rights. The final guy was "Duty Manager Jerry Estes" (finally, I remembered somebody’s name). We went through the standard script. He then claimed that the reason photographs aren’t allowed is because of the controversy over the images taken by the "advanced imaging" machines, and that absolutely NO images are allowed of the people in the machines. This was bogus, of course. It actually would be a valid reason if I had photographs of the console showing naked people, but that was locked away in a back room somewhere. My guess he was just looking for another excuse to see the pictures I had taken. He offered a compromise: if I were to delete pictures of people inside machines, then he would allow me to keep the rest of the pictures. I agreed (I was getting bored, and truly, I didn’t have a lawyer, so I didn’t know how far I could push this). So we reviewed the pictures, and he forced me to delete one. That one didn’t show a person inside of a machine, just a person in front of a machine, but I didn’t argue – it’s nearly identical to another picture. After that, they let me go as if nothing happened. The reason I took the pictures was to blog on a typical security issue that, in the industry, is called "security theatre". Screening techniques are chosen to make the public feel safe, not to stop terrorists. The "advanced imaging" machines that see through clothing are a good example. First of all, terrorists can get around them pretty easy, but either putting C4 in a body cavity or surgically implanted. Secondly, terrorists are not deterred by "random selection". The goal of the terrorist is to blow themselves up. Getting caught means not dying, but still has a (lesser) terror effect because people will get scared from the attempt. It’s a win-win for them. Sure, random selection will deter us from bringing contraband (like nail clippers [well, allowed now]) onto a plane, but I doubt it’s a big deterrent to a suicide bomber. So, I wanted a picture of the L3 Provision machine in order to include with my blog describing this. Here all the pictures I took, minus the one I was forced to delete. According to (right-wing conspiracy theory) http://canadafreepress.com/index.php/article/30286, the Obama administration is labeling people like me a "domestic extremist". Ok, I'm being a bit melodramatic here, I believe in accountability and am not trying to protest the security measures, but I'm not sure that law enforcement can understand the difference (especially since this post has been linked from posts labeled Resources for National Opt Out Day). Ken Murray points out this link of TSA jokes http://www.examiner.com/movie-in-boston/tsa-tsa-tsa-oh-lord-almighty-tsa. @eileenludwig points to TSA's own blog post clarifying that I can take pictures http://www.tsa.gov/blog/2009/03/can-i-take-photos-at-checkpoint-and.html. My ornery curmudgeon of a father makes the recommendation that I look at their tag and speak to them using their names. It's easy for them to hide behind the character of a faceless bureaucrat when you don't know their name. But when you make it clear you know their name, they are more likely to fear that they will be held accountable for their actions. Intimidating as all hell. Hey, I just remembered. I don't remember them looking at my identification (other than the normal check further back in line). I think the incident will be attributed to "annoying passenger" than "Robert Graham". Here is another guy detained for taking pictures http://boardingarea.com/blogs/flyingwithfish/2010/11/17/so%E2%80%A6i-got-detained-by-the-tsa-at-the-airport-today/. He points out that video cameras probably recorded the entire incident. Apparently, I could have called TSA public affairs at (571) 227-2829, and they would have told the TSA agents that yes, I can take photos. Google for how to to recover deleted images on iPhone. Doh! Phone already jailbroken many months ago. ssh to iPhone (no, the password isn't alpine). This TSA Blog brags how the "Opt Out Day" was a failure, because wait times were actually lower than normal. But they are being disingenuous. Wait times are less because the TSA staffs up with a lot more people during Thanksgiving and Christmas high travel days. That's been true the last several years, which likewise had shorter lines on November 23 as well. In addition, according people I know on Twitter flying today, the TSA simply stopped using the controversial AIT machines in order to prevent the protest from working. That means the protest was a success, not a failure. Lastly, protesters wouldn't cause longer lines -- traffic would simply be redirected through the metal detectors. The protesters would simply cause fewer people to be imaged/groped. "I tried to act nonchalant, as if I didn’t care about the time, but I certainly did. This is Thanksgiving, the flights are full, so it’s unlikely the airline would be able to book me on another flight. If I missed that flight, it would mean missing Thanksgiving. On the other hand, it would be a better blog if the TSA forced me to miss my flight for doing something that is perfectly legal. So I decided I was willing to miss my flight, making me as calm on the inside as I was trying to project on the outside." Good for you Robert! Great post. Thank you so much for standing up for our rights! If people don't start standing for principle, we'll keep getting walked all over. Great job! Other than not telling the police officer that you were being detained without legal, published or explained reasons, that was freakin awesome. If you haven't done a lot with your phone since then, you might be able to retrieve the "deleted" image with standard undelete software. Deleted files are not removed from the disk - their index references are simply removed and the space they occupy is marked as free for overwriting. If nothing else have overwritten that data yet, then the images are still there. It's taking about 3 hours over Wifi (8-gig iPhone, 802.11b wifi). Almost half done. Glad to hear you're not too much worse for the wear. Though my opinion is if you have to go to the airport more than two hours early, the terrorists have already won. Now I'm feeling guilty that I asked my family to be the ones to travel to visit me for the holidays this year.
" I agreed (I was getting bored, and truly, I didn’t have a lawyer, so I didn’t know how far I could push this)." This is a fascinating idea. That is the answer. Some of us need to hire lawyers to go with us through security. I want to pursue that angle. The TSA is really doing a great job, now they're trampling on both First and Fourth Amendment rights in the same security checkpoint. This is terrible stuff. I really hope the public in general will wake up to these abuses and demand change. I had to investigate undelete programs and magicrescue is the best one. Thanks for standing up to misinformed TSA agents. It takes guts to look these people in the eye and beg to differ with them. The thinking goes that suicide bombers are expensive, particularly ones that can function in North America. If you're going to go to the trouble of planning the sort of complex, multifaceted operation that is the hallmark of Al'Q, you're going to want it to succeed. Therefore you are going to pick a strategy that does not rely on a random chance that one of your dudes will get caught and the whole thing will unravel. You will plan around random security checks rather than send people through them and hope they make it. Although foiled terrorist attacks generate terror, thus far these attacks have been foiled by the incompetence of the terrorists moreso than the effectiveness of the security apparatus. "TSA foils terror plot" is not the headline that Al'Q is looking for. Regarding suppository bombs, its worth asking whether that attack technique imposes practical limitations on the amount of explosives that could be used, which makes them ineffective for taking down airplanes. I don't know, but its worth asking. The liquid container size limitations, for example, are intended to prevent you from carrying enough liquid to make a bomb big enough to matter. Its also worth pointing out that its harder to hijack a plane with a suppository bomb. A fake bomb would perhaps be just as effective as long as it looked convincing and you were scary enough, which I suppose is why engineers get hassled when they try to board a plan with a breadboard project. 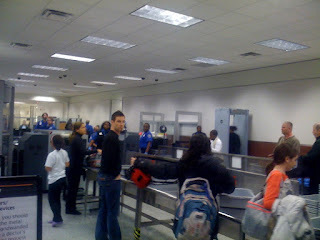 For the record, I hate, absolutely hate, being strip searched everytime I get on a plane. Its not an acceptable imposition and I'm glad that so many people are protesting it. There needs to be political pressure on the TSA to consider alternative solutions. Its not just about whether or not these things are effective. Its about whether or not the indignity is necessary. Good job, Robert. Thank you. Is it illegal to take pictures of customs officers and/or a customs booth? I was taking pictures of our trip to Canada, and wanted to take pictures of the tiny customs booth at Cape Vincent, NY, from which you take a small ferry to Wolfe Island (15 bucks), drive across Wolfe Island, and then take a free ferry to Kingston,Ontario. I was going to brag how easy the process was compared to going over the Thousand Island bridge and going through customs there. But the officers stopped me and told me it was illegal to take pictures of them. @eulogos I don't know, you'd have to look online. I don't want it to be illegal (accountability is more important than security), but I don't know the law. In any case, just because a border guard says so doesn't make it true. I had 10 TSA agents tell me taking pictures was illegal and all 10 of them lied. "I don’t want to be like those hippy douche-bag activists that try to provoke the TSA with their passive-aggression or belligerence." Ha! I see what you did there... did you? Be a belligerent douchebag toward hippies? Check. @eulogos, as a Canadian it's my understanding that taking photographs is prohibited going through customs, but not security. @eulogos, as a Canadian it's my understanding that taking photographs is prohibited going through customs but not security. It occurs to me that "Protesting TSA security screening delays air travel" is equivalent to "One has to admit, the TSA makes the planes run on time". Might I suggest Evernote, which syncs with the cloud as soon as you save the photo? You can then "delete" the photo, which moves it to the Evernote deleted items and remains there until you delete it again. If not Evernote, the Flickr app, Instagram, PicPlz, TwitPic, Yfrog or any other photo hosting service that puts a copy in the cloud, or any app that syncs with Dropbox or another cloud-hosted service. You can delete the local copy, but the cloud copy is still up there waiting for you. (And it's a little easier than jailbreaking and SSH!) Also, nice job locking your iPhone. Many people don't but I wish they did. An option for next time would be to drop an Eye-fi card in a point and shoot, and have it uploading the images as you take them over a tethered phone. All I want to say is thanks. More of us need to stand up against this nonsense. It IS security theater and the terrorists ARE winning. Not 100% sure here, but aren't law enforcement (or pseudo law enforcement) officials required to have a warrant before they even see what picture you took? Even that is covered by the 4th Amendment, if I understand correctly. A lot of airports now have free Wi-Fi, or Wi-Fi that's not free, but is included in a smartphone subscription. Some photo apps on the iPhone can be set to upload automatically to Flickr and elsewhere. I wonder what would have happened had you said, I'm perfectly happy to delete all these images--and had all of them already stored elsewhere. Robert, along with the many others, I want to offer my thanks to you for standing up for your rights. I agree with Maria, we need to stop the TSA from trampling our rights. What are the most effective ways to oppose this draconian measures? Two I can think off are to write my favorite airlines and to write my politicians. Just so you know for future reference, most airports strongly frown upon pictures being taken in screening/customs areas. That's probably why they detained you, and I'm surprised you haven't run into it before. That being said, I'm glad to see so many people standing up to the TSA, just keep an eye out and don't be surprised if it happens again (especially on an international flight). Happy travels! And keep up the good work. Interesting, fascinating, mostly responsible post. However, "I had 10 TSA agents tell me taking pictures was illegal and all 10 of them lied." blurs the line between lying and misinformation. All 10 of them may have been wrong, but the word lied implies te intentionally deceived you, and it is likely them some of them thought they were correct. I had a similar problem a couple of years ago, accidentally deleting an entire set of images from an SD card. After a lot of scrambling (and googling) I was able to locate and download a free binary - actually, source code that needed compiling - called photorec. I'm on OSX, and was able to get it compiled to run in the terminal. It worked perfectly. @warren I tried PhotoRec and could not retrieve the photo (or thumbnails of the photo). Pulled everything else out of the 'dd' image, though. @karen That's a fair criticism, and maybe I'm exaggerating here. The reason I chose it was the meaning that they didn't care about the truth. They obviously didn't care about the truth. Whether it's at the checkpoint or the information the TSA publishes, the thing that drives the "truth" is not an honest respect for the truth, but whether they will get caught in a falsehood. Thank you for your blog post. It's good to see people report every instance of the TSA's obsessive power trips and be constantly reminded of the violation of our rights that takes place at the airport. I'd like us all to possibly take the opportunity to use your experience to learn how far we can challenge the TSA while still making our flights, since that is the reason 99% of people are placed in that situation. Still, in the spirit of learning, I must say I'm a bit disappointed with some choices you made in the situation. • You chose to submit to a device that many scientists believe poses a risk to your health. Although you seem to object to them, you note that you "didn’t want to push it, so I meekly complied." Your call on this one, but why be forced to submit in such a humiliating way to an agent of the government? • You deleted photos you knew you had a right to take. Actually, I guess I can't tell from your blog post if you knew this at the time, but I'm assuming so. Why, you're probably wondering, am I criticizing your decisions? First of all, I'm aware that you put yourself in an extremely awkward situation; props to you! However, I think when those of us who object to these policies initially resist but eventually give in to the TSA agents, we just fuel their arguments that we're simply trying to "disrupt their operating procedures" and reward them for their bullying behavior. Bloggers like yourself allow all travelers to be reasonably informed about what's allowed and what's not. Know what the policies are and comply as required, but never meekly just give up on your rights. Make them follow their own policies! Finally, you claim to not be one of those "hippy douche-bag activists", but seriously? Come on! No one's arguing that the TSA lines are the next Woodstock. All of us are just trying to remain calm and submit to reasonable security checks without having our privacy rights thrown in our face...or more recently, groped in the balls. Calling your fellow citizens who remain vigilant of all of our rights douche bags accomplishes nothing. Apple has implemented something like SATA TRIM since the first iPhone. Your deleted files should be gone. What are the most effective ways to oppose this draconian measures? Two I can think off are to write my favorite airlines and to write my politicians. Any other suggestions? Neither meekly submit nor aggressively disrupt. Politely and firmly stand your ground for what you believe in. Punks that act out of anger just make everything worse for everyone. #2 Write a physical letter with your hand to politicians. Mass e-mail bombings are worthless because the politicians know it took no effort to do them. Writing a letter in your own words sends the unwritten message "this means enough for me to take the effort to write a letter". Robert, thanks for the suggestions. I'll be sending out some letters tonight. Just for the record, nail clippers have been allowed on the plane since Dec 2005. I'm a little disappointed by your emotional response to the statement "Not all parts of the government are accountable to the public, especially the TSA." Ultimately all parts of the government are accountable to the public, but that does not mean that they are directly accountable to the public. For example, the members of the Supreme Court are impeached by the Senate, but do not answer directly to the people since they have a lifetime commission. But in the heat of the incident, it's easy to read hostile intent in the misstatement of underpaid, stressed management. So while I'm disappointed, I understand the reaction. And your behavior, as you describe it, seems beyond reproach. I commend you on your restraint. Thanks for showing the TSA to be who they are , the Stasi of America. I was treated more well by them than the TSA treats American citizens. While I'm personally conflicted as to whether photography should be allowed in the screening areas, I'm 100% behind you given that the TSA rules are clearly stated and that their agents don't know their own policies. That seems to happen often -- where government agencies enforce what they THINK are the rules, rather than what's actually law. That said, with respect to knowledge of the rules, you'll be happy to know that the TSA removed nail clippers from the list of carry-on contraband in 2008. Clip away. Correction to my previous comment -- nail clippers have been allowed since December 2005. Whether the TSA agents know this, however, is anyone's guess. punishable by penalties used for the most severe and heinous violent criminals. This Country has become a sad joke, and it's not the liberals or the conservatives that are responsible for it. They work for the same side, you know, the people that don't have to go through checkpoints, and be irradiated and scanned. The elite society of business and governement officials that are either immune or can buy their way around the restrictions placed on us mere mortals. There is no material difference between the US Government and Business. Look at the Chamber of Commerce. They are the Star Chamber, hello did anymore pay attention during Wall Street episode 1? Are you going to file a complaint? You should! "After traveling: You may contact the External Compliance Division of TSA's Office of Civil Rights and Liberties to file a complaint." Details about how to file are on the above-linked website. Why are you re-posting the canadianfreepress blog post about alleged TSA documents. That is clearly a fake story invented by a right-wing blogger. A real lover of freedom would post such a scurrilous memo; until he does, it is abhorrent rumor-mongering. "No, ALL parts of the government are accountable to the people..."
Not to be pedantic, but this is false. The federal judiciary--a branch of the federal government--is NOT politically accountable. That's the whole point of an independent judiciary. sometimes when you argue with an idiot, it's hard for an observer to tell the difference. just saying....I hate the policy since it does nothing for actual airplane security, but honestly, what did you accomplish? Excellent comment, I'll edit it to include that the source is not trustworthy. But I've worked with law enforcement and the FBI for a long time (in the realm of cybersecurity). Regardless of how the Canadian Press spins the issue, it's the truth. One of the FBI's job is to track the ring leaders of any sort of domestic disturbance. It doesn't matter if they are the KKK or Martin Luther King, the FBI kept tabs on them. I've also been on the other side. I've personally been threatened by the FBI in attempt to cancel a speech they didn't like. It's not some sort of grand conspiracy, it was really the result of bumbling stupid agents, but nonetheless, I know that the motives of the FBI aren't pure. I'm certainly not on their short least of ring leaders, like the guy who created "Opt Out Day", but I'm probably on a longer list somewhere. Sometimes ad hominem attacks reflect worse on the speaker than the target. but honestly, what did you accomplish? But standing up for your honor and rights isn't about accomplishing anything. I didn't go into this trying to antagonize the TSA. They had been shouting for a couple seconds before I realized those shouts were directed at me. I wasn't trying to accomplish anything in particular. Stoopid pedanists. :) Independence of the central bank also pretty important. Let's limit this to "all government" to "all parts of the executive branch and congress". While the military, intelligence, police, and security services often have secrets, they are also the most common source of corrupt abuses, and therefore, require the most scrutiny by the public. You chose to submit to a device that many scientists believe poses a risk to your health. Different device. There are two systems in use, one which uses microwaves (harmless), one of which uses x-rays (potentially harmful). I walked through the microwave one. why be forced to submit in such a humiliating way to an agent of the government? Why choose to be humiliated by the treatment of government officials? I'm interested in rights, not insults. I got angry because that lady claimed the TSA was above accountability, not because she was abusive (although she was abusive). Good point. Mostly because I was bored. Also, because by forcing me to delete it, they crossed another line -- they destroyed something that belonged to me. Calling your fellow citizens who remain vigilant of all of our rights douche bags accomplishes nothing. I see fellow travelers that take offense at the most reasonable of requests. 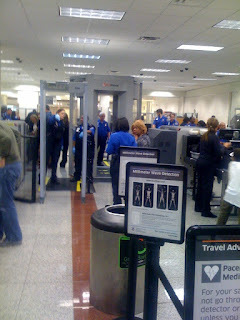 I see activists provoke the TSA because they are angry, not because they are standing up for principle. A good example is that Meg McLean incident. She wasn't treated badly, she deliberately escalated the situation. I don't want to be lumped in with those people. I want people to know that I was calm, polite, and cooperative -- except for the principle I was standing up for (that I could take pictures to keep the TSA accountable to the public). Another example of the weakest link in the TSA equation. The screeners themselves. Clearly these people understand neither the letter nor the intent of the regulations concerning the images produced by the scanners. The images that must not be saved and/or leave the area, are those of passengers inside the scanner as seen by the TSA agents on their monitors. This of course has nothing to do with photos taken by you unless of course they were stupid enough to have the scanner monitors in plain view of passengers so they might have been in a shot? (which indeed would be a violation of the regulations on their part). The entire group of agents were collectively too stupid to comprehend the application of the rules. The real problem here isn't the devices. It's the all too common, former security guards, lacking the qualifications (literacy, training and temperament) to properly perform the job. well, you forced them to be aware of their own stated policies. you demonstrated that they do not have the absolute authority that they think they do. you displayed the integrity and courage of the informed citizen. and you let them know, in no uncertain terms, however calmly and rationally, that dissent and terrorism are two completely different things. all these are utterly valuable. i wish more people had the audacity to do likewise. Just use Dropbox's feature that auto-uploads your photos to the cloud as you take them. Not sure how the TSA would react to being told that, however. Unless TSA agents are iPhone savvy, you can use a camera app that maintains a separate "light-box" or "camera roll" while auto-saving to the regular photo library. Then you can delete as you like while having copies in the suspended camera app. Technically the answer is between "no" and "maybe" when it comes to taking pictures in an Airport. Because you are on "private" property. And there are no civil rights protections against taking pictures in such an instance. You can take pictures, The typical "family" photo kind of photo taking. But if you stray from that? as you obviously did? You have to comply. First off, I would like to make it clear I am in no way supporting the TSA. I think the machine is degrading and useless; however, the TSA had every right to detain you. While taking pictures is legal, taking pictures of a security check point makes you suspicious. Seeing as TSA's machine cannot YET read minds they do not know your intent. As an example, the wearing of a ski mask is not illegal, but if you wear one at 2 am outside a 7-11 is it unreasonable for law enforcement to detain you? An arrest, in this case, would have been unreasonable but detaining you was legal and with probable cause. I agree with your methods and what you did; however, just be aware that even with a lawyer present you would have been detained just as long. Also this machine is flash to shut the politicians up. Anyone in a position of power in the anti terrorist realm knows this machine won't stop most terrorists. That is why we have the air marshals and the under cover agents walking the air ports. Keep fighting the good fight sir. The worst thing about this entire experience is the TSA nit-wit that thinks an acceptable response is that the TSA is not accountable. That is borderline psychotic, to me. Technically and Constitutionally, members of the Judiciary can only "hold their Offices during good Behavior;" therefore, an accountability process is implied to punish "bad Behavior." Since all office holders are accountable, ultimately, to the public, so are members of the Judiciary. @crabapple - I don't know what airport is the one in question here, but the airport in my town is Public Property run by an airport commission that is appointed by the Governor. I don't think anybody could argue it was private property. (Sarasota, Fl). Somebody needs to make a decoy iphone Photos app that pretends to erase photos. Slightly confused by your comment about Meg McLean escalating the issue. Seems pretty close to your experience, in that she wanted the TSA to follow their own policies. Perhaps she was more animated than you, and even more angry than you were... Fact is, she had a right to be angry, as did you. It appears to me that TSA plans on punishing anyone who resists their actions, even when those resisting are following the TSA rules. Imagine being held in a glass closet for 45 minutes, without your shoes, displayed for everyone to see... Humiliating and an effective lesson for everyone else to see. Behave or else you could end up in the box. Be fore all this high fangled scanners come along I fly a few times with my 2 daughters. About 2 years ago we were at the airport with my husband who was therr to help me through the sercerity check and to get to the gate. I was holding my 1 year old Chey and as we get to the scanner they told me i had to take off my Chey's open toed sandels. I was like "what!?" Trying to do stuff one handed is tough enough. Then we go throug to scanner and was told to walk over to the side. So me and Chey go over to the side and sit down while they find a woman TSA. My husband was looking at me mouthing whats going on. I shook my head. Then when she finally came over she wanted to pat my 1 year old down. she checked her diaper, her chest and belly. Then she wanted to take a look in the diaper bag. I had to throw away a clear bottle room tempature water for the formula for the other daughter. But the funny thing is through all that scanning process and manual search they didnt find that i had a pocket knife in my purse. (I didnt even know it was in there). After I met back up with my husband i tols him that we were never flying again, except to fly back home. Now we drive 12 hours to Texas. Thanks for posting that phone number. I'm going to keep it handy for when I go through that area, just in case. And this is exactly why I have my phone set to auto-upload every photo and video I take to my DropBox account. however that url delivers a 404 so I guess they DON'T want you to know about the legality of taking pictures.